Bella hit the beach for the first time. Well, not really her first time on the beach but it is her first time to play on the beach. She loved the beach so much! She splashed on the water and played with the sand. At first I was hesitant to let her play on the sand because she might not like it. I thought she'd be shouting "Ewww..Yucky!" But she didn't. Instead, she enjoyed sitting on the small hole we dug so she can sit inside it like a queen. She loves it when the waves get into her queenly throne. You might observe that some parents really provide a sand box for kids to play. This is because of the advantages the kids can get from playing with sand. 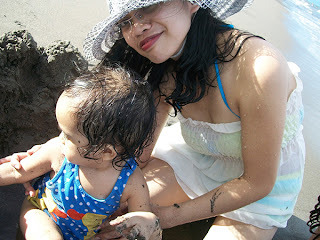 Sand is something that interest toddlers and kids alike. This could be because of its unique texture and the wide variety of activities they can do with it. 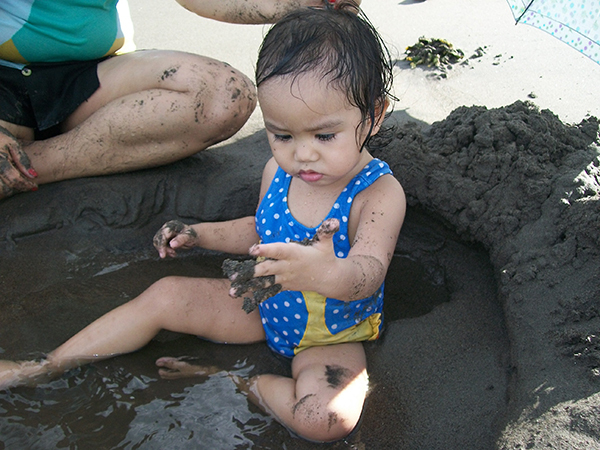 With sand play, your kids can acquire developmental advantages for physical, cognitive, sensory, social, and speech. 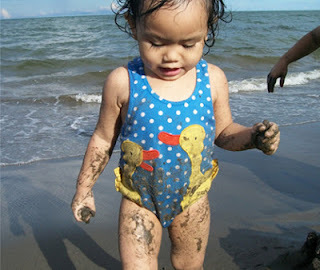 With the digging, jumping and running on the sand, your child will develop physically. They learn through active physical activities, facilitate body awareness, have eye-hand coordination (with the use of shoves, scoops, etc), fine motor skills and balance and coordination with the body. Like Bella, she didn't just sit on the sand and took a bath in the water but she also run and walked on the sand - jumping even! Kids will be able to observe by sorting things. Say, water and sand, shells and sand and others. This can help for the cognitive development of the children. They will also be able to ponder on cause and effect situations. Like if they'll wet the sand it becomes sticky making it easier to roll into a ball while a dry sand just fall off the hands. This will also help the child investigate, classify, compare and solve problems. Their curiosity and imagination will be also be developed. We all now that textures are good for our little loves for it can help the kids to experience a multitude sensory information through touching. This can also help them identify different items through their texture. Sand has a texture that is apart from their plastic toys which is one of the reasons why they find it enjoyable. Once your kids are involved with emotionally engaging activities, it can urge them to say things. Bella kept on saying "Amazing!" while playing with the sand. She was amazed by how the sand flows with the water, with the texture of it and how she can freely play with it any way she want. That is why this kind of activities can help develop speech and language. It can also include discussion observation like when Bella picked a leaf, I explained to her about it. It can also encourage question-asking, spontaneous speech, requesting, offering and conceptual language. Kids have that feeling of being free once they are playing with the sand. It is like they were allowed to get dirty and they'll grasp that moment. I could recall a TV ad where a little girl planted on a pot and she got dirty. But she said, "I got filthy, I got dirty, but see...I learned"
Yes, Bella got dirty and tired today but I know she learned! So that's it for today! We hope you learned something from this post. I LOVE going to the beach for these reasons. My daughter just scoops up the sand and lets it fall to the ground and repeats this over and over again. The biggest downside is the mess my daughter is and getting sand out of her hair. 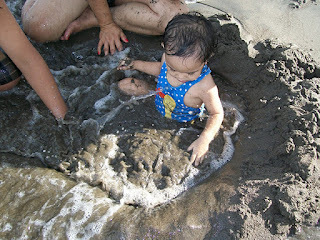 My kids love playing in the sand and building rivers and lakes! Do you think those sand or water play stations are effective? it would be nice to have something right in our tiny yard. Awww...cute pictures! My girls love to play in the sand. And I never thought of it as being so educational - interesting! Yah. It is indeed amazing that even playtime can give tons of learning to our kiddos. It's so great that your daughter plays in the sand; I would love for my son to do the same! It may take some time and getting used to, but he just wants nothing to do with it. And I love that sands offers tons of learning opps for children! My daughters recently went to the beach for the first time. My baby wasn't too sure about it, but my toddler LOVED it! Thanks so much for joining us for the Turn It Up Tuesday blog hop! !